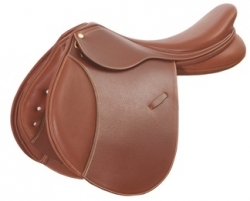 The Collegiate Convertible Alumni CC saddle si the choice for the educated rider. It features beautifully tanned, hand-picked European leather which set this saddle apart from the competition. Its medium deep, wider seat is perfectly balanced to help riders achieve the correct position on the lfat or over fences. The padded flaps with knee rolls provide additional support and ensure confidence with a tight and secure fit. It also features recessed stirrup bars to eliminate extra bulk under the thigh area. The flocked panels and the Easy-Change Gullet System provide comfort as well as the capability to fit several horses with one saddle. Size: 16.5", 17", 17.5", 18"